Fossil fuel production has left a lasting imprint on the landscapes and communities of central and northern Appalachia. Mountaintop mining operations, pipeline right-of-ways, oil and gas well pads, and hydraulic fracturing wastewater retention ponds dot the landscapes of West Virginia and Pennsylvania. And although advocacy groups have made progress pressuring regulated industries and state agencies for greater transparency, many communities in central and northern Appalachia are unaware of, or unclear about, the extent of human health risks that they face from exposure to these facilities. A key challenge is the discrepancy that often exists between what is on paper and what is on the landscape. It takes time, money, and staff (three rarities for state agencies always under pressure to do more with less) to map energy infrastructure, and to keep those records updated and accessible for the public. But with advancements in deep learning, and with the increasing amount of satellite imagery available from governments and commercial providers, it might be possible to track the expansion of energy infrastructure—as well as the public health risks that accompany it—in near real-time. Figure 1. Oil and gas well pad locations, 2005 – 2015. Examples are at the core of machine learning. Rather than try to “hard code” all of the characteristics that define a modern well pad (they are generally square, generally gravel, and generally littered with industrial equipment), we teach computers what they look like by using examples. Lots of examples. Like, thousands or even millions of them, if we can find them. It’s just like with humans: the more examples of something that you see, the easier it is to recognize that thing later. 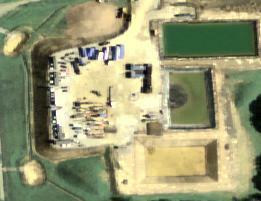 So, where did we get a few thousand images of well pads in Pennsylvania? 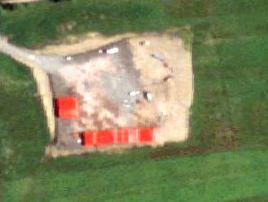 We started with SkyTruth’s Pennsylvania oil and gas well pad dataset. 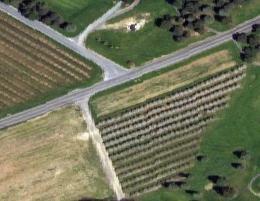 The dataset contains well pad locations identified in National Agriculture Imagery Program (NAIP) aerial imagery from 2005, 2008, 2010, 2013, and 2015 (Figure 1). 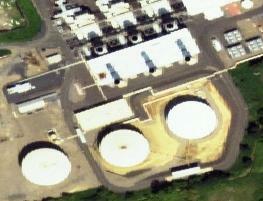 We uploaded this dataset to Google Earth Engine, and used it to create a collection of 10,000 aerial images in two classes: “well pad” and “non-well pad.” We created the training images by buffering each well pad by 100 meters, clipping the NAIP imagery to the bounding box, and exporting each image. The images above show three training examples from our “well pad” class. The images below show three training examples taken from our “non-well pad” class. We divided the dataset into three subsets: a training set with 4,000 images of each class, a validation set with 500 images of each class, and a test set with 500 images of each class. We combined this work in Google Earth Engine with Google’s powerful TensorFlow deep learning library. We used our 8,000 training images (4,000 from each class, remember) and TensorFlow’s high-level Keras API to train our machine learning model. So what, exactly, does that mean? Well, basically, it means that we showed the model thousands and thousands of examples of what well pads are (i.e., images from our “well pad” class) and what well pads aren’t (i.e., images from our “non-well pad” class). We trained the model for twenty epochs, meaning that we showed the model the entire training set (8,000 images, remember) twenty times. So, basically, the model saw 160,000 examples, and over time, it “learned” what well pads look like. Our best model run returned an accuracy of 84%, precision and recall measures of 87% and 81%, respectively, and a false positive rate and false negative rate of 0.116 and 0.193, respectively. We’ve been pleased with our initial model runs, but there is plenty of room for improvement. We started with the VGG16 model architecture that comes prepackaged with Keras (Simonyan and Zisserman 2014, Chollet 2018). The VGG16 model architecture is no longer state-of-the-art, but it is easy to understand, and it was a great place to begin. After training, we ran the model on a few NAIP images to compare its performance against well pads collected by SkyTruth volunteers for our 2015 Pennsylvania FrackFinder project. 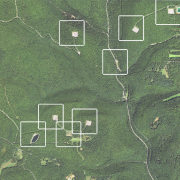 Figures 4 and 6 depict the model’s performance on two NAIP images near Williamsport, PA. White bounding boxes indicate landscape features that the model predicted to be well pads. Figures 5 and 7 depict those same images with well pads (shown in red) delineated by SkyTruth volunteers. Figure 4. Well pads detected by our machine learning algorithm in NAIP imagery from 2015. Figure 5. Well pads detected by SkyTruth volunteers in NAIP imagery from 2015. Figure 6. Well pads detected by our machine learning algorithm in NAIP imagery from 2015. Figure 7. Well pads detected by SkyTruth volunteers in NAIP imagery from 2015. One of the first things that stood out to us was that our model is overly sensitive to strong linear features. In nearly every training example, there is a clearly-defined access road that connects to the well pad. As a result, the model regularly classified large patches of cleared land or isolated developments (e.g., warehouses) at the end of a linear feature as a well pad. Another major weakness is that our model is also overly sensitive to active well pads. 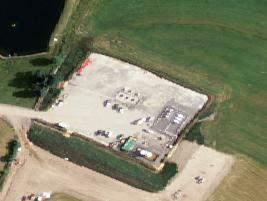 Active well pads tend to be large, gravel squares with clearly defined edges. Although these well pads may be the biggest concern, there are many “reclaimed” and abandoned well pads that lack such clearly defined edges. Regrettably, our model is overfit to highly-visible active wells pads, and it performs poorly on lower-visibility drilling sites that have lost their square shape or that have been revegetated by grasses. Nevertheless, we think this is a good start. Despite a number of false detections, our model was able to detect all of the well pads previously identified by volunteers in images 5 and 7 above. In several instances, false detections consisted of energy infrastructure that, although not active well pads, remain of high interest to environmental and public health advocates as well as state regulators: abandoned well pads, wastewater impoundments, and recent land clearings. 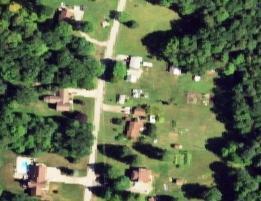 NAIP imagery is only collected every two or three years, depending on funding. So, tracking the expansion of oil and gas drilling activities in near real-time will require access to a high resolution, near real-time imagery stream (like Planet, for instance). For now, we’re experimenting with more current model architectures and with reconfiguring the model for semantic segmentation — extracting polygons that delineate the boundaries of well pads which can be analyzed in mapping software by researchers and our partners working on the ground. Keep checking back for updates. We’ll be posting the training data that we created, along with our initial models, as soon as we can.